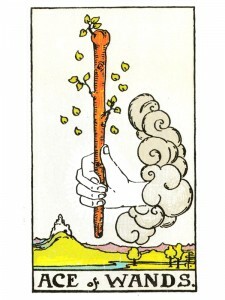 Listen to the Ace of Wands – you are an enlightened being – KNOW it! Live your life to it’s fullest. KNOW what gives you energy and vitality and be passionate. Change and expand – see beyond the superficial, material reality. New activities are starting in your business and social affairs – the seed is within your heart. You will experience spiritual self–realization – awakening. You have been given the spirit to begin, the desire to want your ideas to grow and prosper, the first impulse and passionate will to begin a new job, a new way of life or a change in your career. Listen and trust your “Inner Self” – do not rely on the advice of others. Mental strength will be provided through deep understanding and insight. A higher state of awareness teaches you humility, as you come to understand the “source” of your bursts of energy and begin to understand that ultimately, you have done nothing to deserve the optimism and greater energy that allows you to overwhelm other people. Accept any invitation that is offered to you now – look forward to a special letter or telephone call. Important information will be arriving soon. The commencement or completion of a spiritual path or project. Spiritual independence – a true centering on the being within. From here your karmic purposes can unfold gently and completely. You are highly intuitive now. Apparent good luck as you achieve major goals with ease. The opening and development of the Third Eye – the golden thread linking the crown chakra with the clouds. The antenna for receiving God’s messages of your lessons to be learned. What has aroused your passions and desires? How do you want to express yourself creatively? What do you feel the impulse to do? Into what is your energy and enthusiasm flowing? What new opportunity is being offered you? Next to Tower: You are frustrated and tired only because you cannot make your idea or project materialize. Pentacles and Cups on all sides: Good news is coming – be happy. Next to Devil: Someone may feel hurt and is not allowing it to show – take some time to analyze your relationships. In the first position: A lifetime of service is the essence of your Karmic Contract. Yours is the ability to cope with major upheavals with relative ease. Make the most of the energy available to help others in their times of trial. There is an easy flow to your nature as you even out the peaks and valleys of everyday life. Source of new message. In the second position: Strong foundation much in the sense of the marsh reed, which, though it blows easily in the wind, nevertheless remains strong, useful for many purposes. Although perhaps not physically apparent, your resources are inexhaustible due to the depth and breadth of awareness, rooted in your becoming an Initiate. In the third position: Blessings abound. A spiritual re-birthing is in progress. Begin now to actively integrate spirituality into your daily routine. Enrich all that you do by paying greater attention to the wonder, the lessons, inherent in the simplest of tasks and activities. In the fourth position: This is not just the love of God, but an infatuation with the ability to communicate intimately with the Divine. The mark of the poet/prophet. A healthy respect/love for your own core of creativity. In the fifth position: You are at the peak of the conscious integration of your intuition, filled with messages that you understand well and are ready to use. You are very pleased with your status, your progress to this point and with your potential. Yet, it is time for a major new step forward, integrating conscious path-work in every aspect of your life. In the sixth position: Impact of spiritual blessings/change on your relationships, your creativity and the extension of self. In the seventh position: The impact of spiritual awareness on your mental affairs. Awakening – lifting of the veil, the opening of your Third-Eye. A challenge to accommodate higher truth, authenticity. In the eighth position: You are feeling the effects of blessing and renewal throughout your body. The physical changes may be very noticeable and yet in actuality nothing may have altered. Things may be the same, yet entirely different. However, the new mood is most likely to eventually, if not immediately, generate considerable change in your Physical/material Plane. In the ninth position: You are at the peak of heart awareness, of the accuracy of your gut instincts, of the positive effect of your subconscious. Dream interpretation will be very accurate and helpful. All subconscious activity, inner resources will be very strong and amazingly similar in clarity and subject matter and content to your conscious daily activities. An infusion of the holy spirit. In the tenth position: A major gate awaits you, not later than a year from now. Get as much old business taken care of as possible, in preparation for a new turn on your path.